Feng shui ideas in interior design have been praised highly in ancient Chinese history, and a lot of those ideas are just starting to slip into modern-day life in America. If you want the bedroom in your apartment in Chicago to be a harmonious, peaceful living space, implementing a little feng shui is not all that hard. There are three primary elements to creating a feng shui bedroom, and they're easy to pull off. Just a few minor adjustments are all it really takes. A bed that is crowded into a corner can make the room feel oppressed and out of balance. Situate the bed in the center of the room or in a place in the room that allows easy access to the bed from either side. It is also helpful to place bedside tables on either side of the bed and to make sure the headboard is against a solid wall without a window. Most people implement some kind of artwork on the walls in their bedroom. If you're trying to achieve harmonic feng shui, make sure you pick your art pieces really carefully. A good rule of thumb is to select art pieces that boast powerful imagery relative to what you want in your life, whether it is peace, love or positivity. Making the wrong artwork choices can completely change the energy in the room. For instance, artwork that feels forlorn or sorrowful can bring down the positivity in the room. In feng shui, every color has its own level of energy, which can either be positive or negative. The colors that offer the highest levels of positive energy are those that are most closely associated with the color of skin, which can range from muted whites and beiges to deep tans and brown hues. When you are painting your bedroom, picking floor coverings or selecting bedding, make sure you opt for color choices that exude those higher levels of energy. You will end up with a more soothing space. 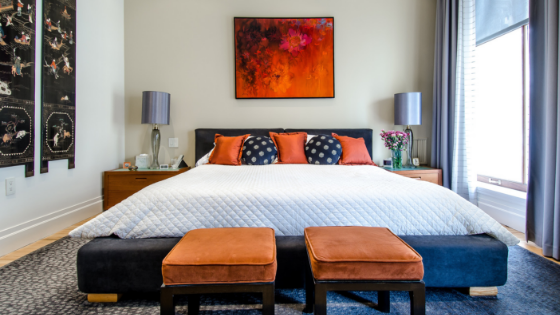 Even though you can go out and hire feng shui experts to help you get your bedroom in balance, you can just as easily implement a few ideas on your own. To find out more about the floor plans in our Chicago apartments, reach out to us at The Montrose.